Leading Indian leisure hospitality and experiential holiday company Sterling Holiday Resorts Limited has unveiled a new TV and digital campaign for pan Indian audiences. The campaign captures Sterling’s brand philosophy of Holiday Differently by showcasing the various curated holiday experiences and discoveries that the brand offers to its guests. Shot across various exotic locations across India to drive variety and curiosity, the first-ever TV campaign by Sterling addresses today’s evolved traveler, who seeks experiences, and not just destinations. 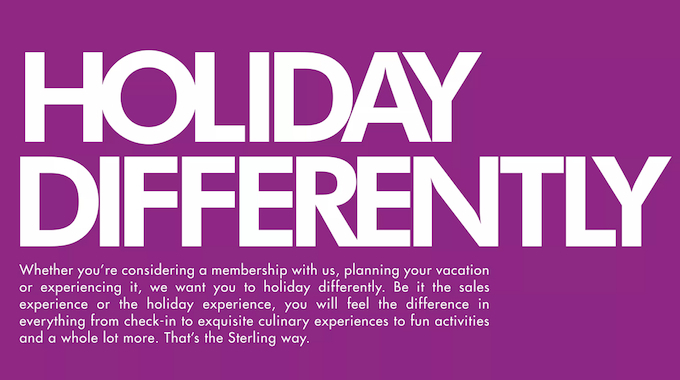 Through this campaign, Sterling, an RCI affiliate that has primarily been known as a vacation ownership brand, shows how it has transformed into an experiential holiday brand for all travellers. Sterling is undergoing an exciting journey of transformation, which started few years ago with the upgrading of its resort infrastructure to best-in-class standards, followed by network expansion to various unique destinations across India. Speaking about the launch of the campaign, Ramesh Ramanathan, the company’s managing director, said: “Sterling has evolved from being a pure timeshare company to a holiday company catering to both our Sterling members and the FIT segment. Peshwa Acharya, the company’s chief marketing officer, added: “Staying true to our new brand promise of Holiday Differently, we have created our new brand film which has a larger than life imagery driven by curated holiday experiences. The film has been created by L&K Saatchi and Saatchi and showcases varied travellers experiencing different discoveries at Sterling Resorts and destinations – from a chef serving biryani in a large jackfruit on a table aboard a houseboat, to a woman trying her hand at a loom with local weavers, holding up a vibrant handloom sari. Rohit Malkani, national creative director at L&K Saatchi & Saatchi, said: “From shooting sunrise in the highest tea estate in India to discovering local sweets we never knew existed, the film is a glorious, non-stop montage of these discoveries and experiences. The TV campaign will be aired on national media from February 2019, and Sterling is planning to amplify the campaign through digital, social, OTT, press and cinema.